Altadill, 52, has enjoyed many round the world race finishes over a varied and successful career spanning nearly 30 years. But finishing in to his own home city, through the waters where he grew up sailing – and indeed coached at the 1992 Barcelona Olympics as part of the Spanish Olympic team – will surely rank as one of the sweetest memories of his life. Altadill was one of the pioneers in the first edition, announced in July 2007 as a skipper of Estrella Damm, but he and co-skipper Jonathan McKee had to retire into Cape Town with technical problems. And he was part of a partnership that did not make it to the start line for the second edition. The Catalan-Chilean duo will harbour some regrets that they had to let Cheminées Poujoulat away when they had to pitstop Neutrogena in to Bluff, South Island New Zealand on 11th February, a diversion which maybe only cost them the statutory 24 off the race course, but their unavoidable loss amounted to close to 1000 miles. 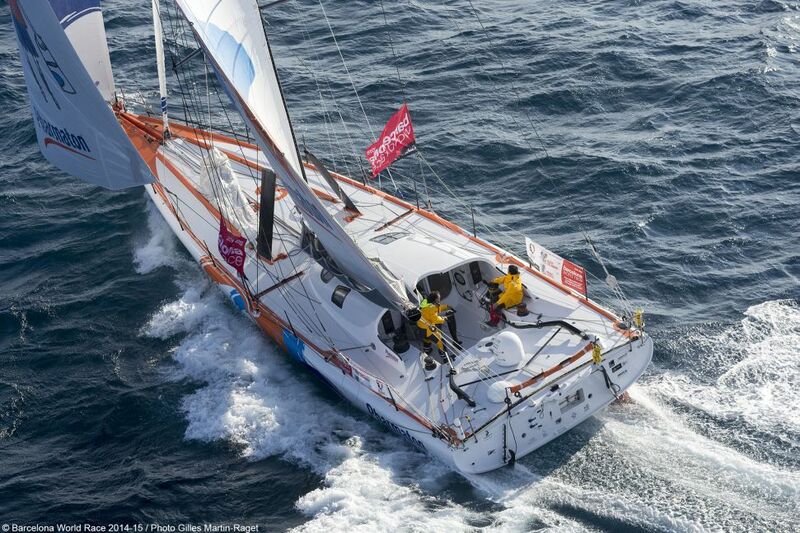 Until New Zealand the Neutrogena duo had proven themselves as the only boat which could pace the eventual winners, Cheminées Poujoulat. And even after they returned to pursue Bernard Stamm and Jean Le Cam, they held the delta, retaining the same high pace until the South Atlantic opened up so nicely for the race winners. Chilean Munoz will complete his second racing circumnavigation, only his second major IMOCA 60 race after partnering Altadill in last year’s New York-Barcelona transatlantic. Altadill sounded relaxed and contented when he spoke very briefly to Race Direction this afternoon, confirming that they had been slowed in light airs but they were expecting to work the afternoon sea breeze off Alicante. At midday UTC they were 80 miles offshore and had just had two very slow hours. He confirmed their projected ETA at between 1100hrs and 1400hrs UTC Monday. He said they are expecting a transition zone later in the afternoon or evening at the latitude of Ibiza. Their biggest sticking point may be a usual calm zone off Tarragona at the edge of the Ebro valley where the drainage NW’ly can fight the gradient breeze and leave a big, quiet area. GAES Centros Auditivos were struggling in very light airs as Anna Corbella and Gerard Marin were closing in to the Straits of Gibraltar. The Catalan duo were making just two or three knots of boat speed but should break in to the Mediterranean later this afternoon. 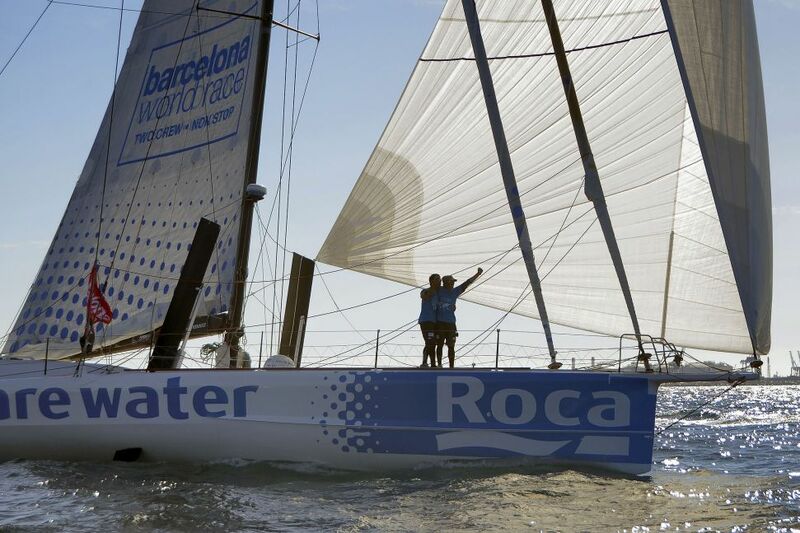 One Planet, One Ocean & Pharmaton and We Are Water are still engaged in their upwind match race. One hundred and 20 miles to the west, Bruno and Willy Garcia have been sailing a course seven degrees higher than their rivals Aleix Gelabert and Didac Costa who are still over 100 miles ahead in terms of DTF. But that progressive convergence of the courses, with the Garcias one knot quicker this afternoon, represent something of a comeback for the Barcelona brothers. Renault Captur are in the NE’ly trade winds making a steady 9kts upwind in 12kts of breeze. Spirit of Hungary are finally making a good N’ly course in the SE’ly trade winds which are quite light for them still but they do seem to have better prospects for the moment, although the Doldrums do look a little voracious for them. 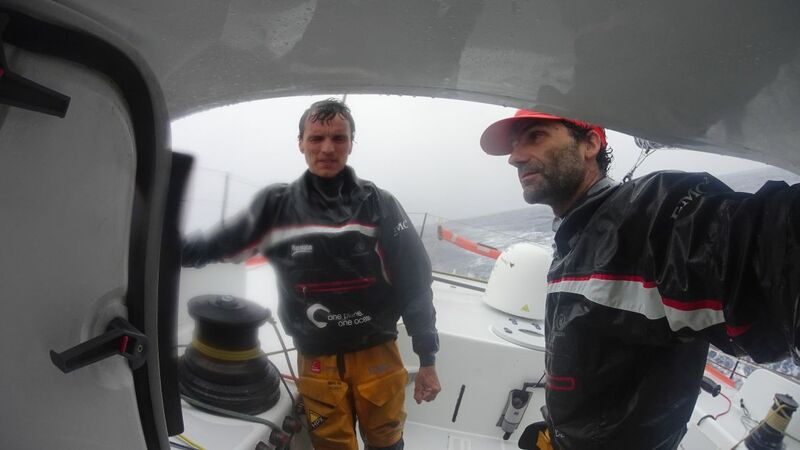 Nandor Fa and Conrad Colman are 800 miles to the Equator now. 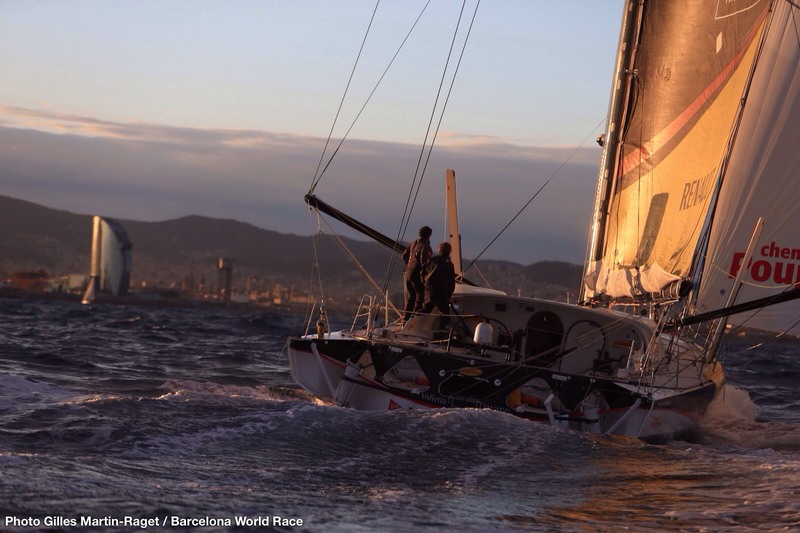 Barcelona World Race : May the fourth be with you….